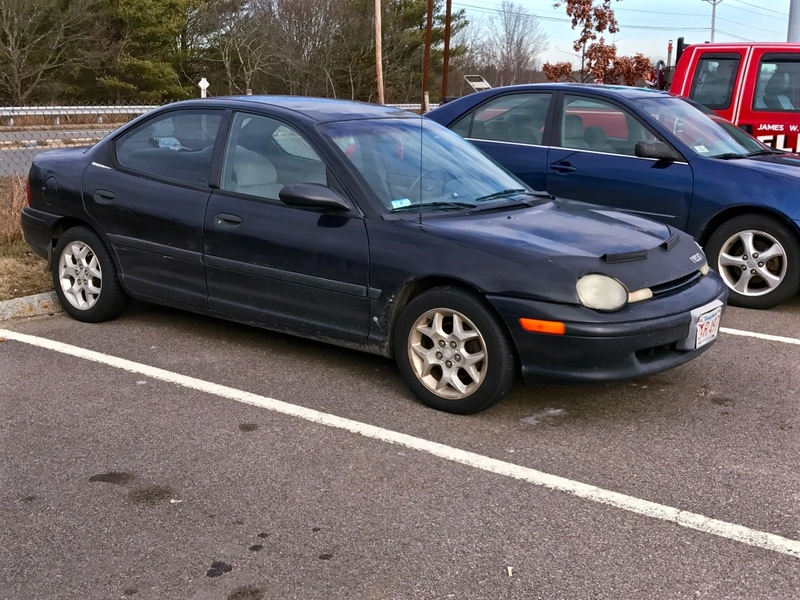 In true CC-effect fashion, to follow up on my pastel green 1998 Plymouth Neon I found, I recently spotted this first-year black Neon, complete with upgraded alloy wheels and hood bra (how risqué!). Despite the many available shades of bright colors, I guess black was the new neon for this car. Just out of curiosity, how can you tell it is a 1995? Don’t all the first gen Neons pretty much look the same? One way to tell is the steering wheel. Even thought the Neons debuted in January of 1994, they were all 1995 models. I remember being very intrigued as to why a car debuting so early in 1994 could legally be called a 1995 model. One of the car magazines explained it that as long as the “year model” only crossed one new years day, then it could be called that year. So the 1995 model year Neons were sold for about 18 months. Anyway, back to determining this car being a 1995. The 1995 Neons all had a two-spoke steering wheel. In 1996, the steering wheel was updated and added to smaller upper spokes. If it has the 2-spoke wheel, clearly 95. If it had the 4-spoke wheel, and that aqua blue badging it is a 96 or 97. If it has the silver badging, it’s a 98 or 99. I used Carfax by license plate. It will tell you the year, make, model, engine, and sometimes trim level of the car currently registered to the plate. Good way to pinpoint the year. Guess everyone should do that for their Curbside finds going forward. The wheels are from a newer car. Use the right gasket (Cometic’s MLS) will hold up to boost or even nitrous) and it is a 300,000 mile engine. Great videos of a first generation Neon being painted with Rustoleum and a roller on You Tube. I watched these last Sunday, so it was surprising when this came up on CC today. Those are wheels off a second generation SXT if I’m correct…combined with the hood bra I’m guessing this owner is attached to his/her Neon. I think it was sometime in 1996 or 97 I saw one of these on display at a local mall in a sort of 1 dealership auto show. You were allowed to sit inside the cars and look under the hoods (I think). Anyway, as the owner of an 89 Civic and then a 76 280Z, I was pretty impressed by that Neon. Roomy behind the wheel, and sight lines to the dashboard and the front corners rivaled my Civic….and assembly quality looked decent, if not 100% comparable to a Honda. I would have probably bought one, but in my area 99.9% of Neons at dealers had that 3 speed automatic transmission. After all the glowing reports I was sure a wanted a Neon with the ACR package, or whatever I could find that was closest to that spec. I didn’t really care, at that point, about the colors. I don’t know the level of influence which Iacocca might have had on the Neon (I’d read that his biggest contribution was insistence on round headlights) but a lot of the car sure seems like it has his fingerprints on it. Stuff like using the old (but reliable) 3-speed automatic and manual rear windows even when the fronts were power. The bottom line was the Neon was a success, even if it was Iacocca’s last. Then Eaton came in and his typical GM penny-pinching and sale to Daimler sent the company on a downward spiral. Not sure how true it is, but the story I “heard” was that Chrysler used a 3 speed automatic transmission because a 4 speed automatic transmission wouldn’t fit. I would not have been surprised if the real reason the 3 speed was used is that it was cheap(er), available, and it was thought that customers wouldn’t care how many speeds the transmission had if the car was inexpensive enough. As far as the power AND manual windows go, I don’t know if 1st generation Neons had that setup but it’s a somewhat common feature in some European cars. And I suppose it could be considered to be a child safety protection device to have the rear windows be manually operated…..like child safety locks on rear doors. I recall the rear windows were because they expected the take rate for PW to be low enough that, combined with the rear windows only opening about 6″, they decided power rear windows weren’t worth it. Also-it meant the coupes & sedans could use the same driver’s door switch panel. The 4-speed auto would not fit the chassis. Considering Chrysler’s poor track record with 4-speed automatics, it was probably just as well the Neon got the 3-speed. IMO they should’ve taken it a step further and shelved the SOHC 2.0. Make the DOHC standard, but manual-only, and carry the K-car derived 2.5/3AT combo over as the option. I think it also reflects how often there are 2 people or fewer in the car. A friend bought a new one in ’96, with the 5-speed and twin-cam. We drove it up to Lime-Rock for the races. Despite it’s somewhat basic spec – manual shift & non-power frameless windows, I was actually impressed with the car. It ran well, was comfortable, and everything worked fine on our trip. He moved on to something else, and his wife had the car when the head-gasket went at about 65K miles. By then, the seats weren’t so comfortable either. His wife replaced it with a Corolla. Still, I thought it was a dumb move when Chrysler axed the car and replaced it with the Caliber. Agreed. The Neon, whether first or second generation, was distinctive and memorable. Not prefect by any means, but memorable. It stood out from the herd. In contrast, I can’t even think what a Caliber looks like – did they even sell it in my country…..? It looks like a Jeep Patriot…or Compass. It was not memorable. Thanks, Daimler. It looks like a something a 10 year-old child might draw, or a shrunken 4-door Jeep Patriot, with a sloped, curved hatchback over the cargo area. I rented one of these in 1995 for a cross country drive. Mine was a white Plymouth, but I’m pretty sure there was no difference whatsoever between the Dodge and Plymouth except for the emblem on the steering wheel…I don’t even think the make was labeled on the outside of the car. These were competitive but not class leading cars, as were most Chrysler products during their mini “golden age” in the mid to late 90s. Decent handling and peppy performance for a cheap compact, and it had excellent visibility. While the 3 speed auto made my rental less than an ideal highway cruiser due to the noise, it still delivered high 20s MPG. I think the Neon would have been a great choice for someone doing primarily city driving. Another thing that stands out as a negative was that with the crank windows, the handle would dig right into my left leg…and I’m only 5-8, so it seems like someone in engineering missed something kind of basic there. I had forgotten about the window cranks. I had 2 of these 1st gen. Neons with manual windows. In retrospect, I was exceptionally lucky. As a traveling salesman, I kept each one until over 200k and never had a hint of mechanical problem with either one. They were so reliable I encouraged family needing a cheap kid car to buy them when the company decided to rotate them out of the fleet. That’s why I remember the darn window crank. I finally figured out I could remove and reposition the window crank to a less annoying position when the window was completely closed. Always wondered if the idiot who wrote the specification for the closed window crank position ever actually drove a Neon. Probably not – or else he had the power window version. Kind of reminded me of the A/C vent some GM designer was fond of positioning atop the center ashtray on certain models. Obviously a non-smoker trying to encourage everyone else to kick the habit long before the rest of us became convinced of the necessity. That kind of sounds more like an assembly line problem where the worker either wasn’t following instructions or wasn’t instructed on the proper orientation of the crank.